For this edition of The Historian, we decided to move away from a subject theme and instead to pay tribute to the HA's branches. 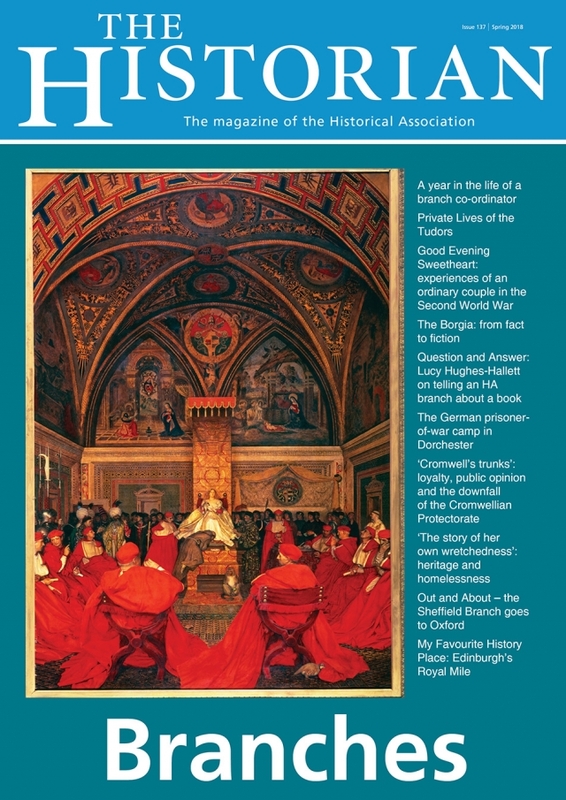 These provide an opportunity for anyone with a love of history to get together, to learn and to discuss a very wide range of fascinating topics, as a glance at the titles listed in HA News reveals. We have chosen a random sample from round the UK, to share with The Historian’s readership. From personal experience, I know it’s not easy to run a Branch; it’s a challenge just finding a venue, a day and a time to suit local members – not to mention choosing topics and selecting speakers – so I have great admiration for all Branch secretaries. In our first article Jenni Hyde describes her year as Branch secretary in Bolton, leaving me in awe of her enthusiasm and energy. She also offers positive ideas for enabling meetings to run smoothly. Hopefully some of our readership will be inspired to have a go at establishing a branch in some of the areas still not represented. There is plenty of support available. It can be hard work but very rewarding. Our chosen articles feature men and women in positions of power, an ordinary couple and a study of homeless people. In March last year, the Richmond and Twickenham Branch was fortunate enough to hear Tracy Borman speak to them on the Private Lives of the Tudors. In her article she describes the evolution of the Privy Chamber under Tudor monarchs – its luxury, ceremony and, above all, political importance. Another fascinating dynasty, the Borgias, was the subject of Stella Fletcher’s talk to the Bolton Branch. She looks at how the family have been treated in fiction over the centuries. Lucy Hughes-Hallett explains differences between writing her prize-winning book on Cleopatra and presenting the material to a live audience, in this case the Lincoln City Branch. She also mentions how sexual and racial prejudice were issues at least 2,000 years ago. Fake news and propaganda were prevalent in the seventeenth century too. Professor Ted Vallance asked the North London Branch to re-evaluate Richard Cromwell’s reputation in the light of evidence revealed in affirmations of support. Was there any chance that Cromwell was a realistic alternative to Charles II? We need to find those elusive ‘trunks’! Away from the rich and famous, at the Glasgow Branch meeting last February, brother and sister Sue and Pete Mowforth took on the roles of their parents, reading from a selection of their letters written during the Second World War. The letters revealed a gentle love story alongside an account of the wartime experiences of an ordinary couple. Reading the article, it is perfectly understandable why this story attracted such media interest. Our final feature from Dr David Howell, summarising his talk to the Cardiff Branch, compares the use beggars made of Tintern Abbey in the eighteenth century and how present-day homeless people regard historic sites. The edition also includes all the regular features: Tim Simkins was Out and About in Oxford with the Sheffield Branch; Dave Martin describes the POW camp in Fordington, Dorchester for Aspects of War and I share My Favourite History Place – Edinburgh’s Royal Mile. We are always happy to have ideas for articles from members and, in particular, I would welcome suggestions and contributions for an edition focusing on Wales, Scotland and Ireland due out at the end of the year.